Yanam, a part of the Pondicherry Union Territory, is the little French counterpart of India, and is a place rich in culture and history. A tiny part of the French India during the days of colonial rule, till the year 1954, the place still represents its French self and still basks in the shadow of the early European settlements. French is still the official language here. This small coastal town, located near the delta of the Godavari river, became a part of the Indian Republic in the year 1954. With its intriguing one-of-a-kind melange of both French and Telugu culture, Yanam is a place you should head to for the next vacation. Like most places in South India, Yanam has a very hot and humid summer. Hence, the best time to visit the place is during the winter season, when the temperature is moderate and never soars above 25°C with a minimum of 14°C. By Air: The nearest airport to Yanam is the Rajahmundry Airport which is located at a distance of 59.9 km from the town. Frequent cab services are available from the airport. By Rail: The nearest railhead is the Kakinada railway station which is near about 26 km from the town. Trains are frequent from this station and it is connected with many major cities of the country. By Road: The town of Yanam is well connected via roadways to the cities of Vishakhapatnam, Rajahmundri and Kakinada. The Yanam bus station is located at the heart of the town. Snuggled amidst the deltas of the Gouthami and Godavari rivers, the Coringa Wildlife Sanctuary, is touted as one of the largest mangrove sanctuaries of the country. With an abundance of rich natural reserve, the sanctuary is inhabited by a wide variety of birds along with some endangered species like crocodiles, otters, turtles and other animals. The entire sanctuary is enveloped in lush thick mangrove vegetation and is also home to a variety of different species of plants. An interesting activity to enjoy at the Sanctuary is pedal boating in the laps of nature. Hope Island is a tadpole shaped little island off the coastline of Yanam. The island is named so, as the island is known to serve as a natural haven to sailors against the forces of wind and tide. The island is one of the most affluent natural ports of the region. Set against the azure blue skies of Yanam, Hope Island presents some excellent views with its striking milieu. Sri Veereswara Swamy Temple is spiritual sanctum situated atop a hillock in Yanam. It is a leading pilgrimage centre for the followers of Vaishnav dharma. Myth has it, that devotees who visit the temple and has issues with their marital life, or still haven't got married, get all their issues resolved, with just a mere visit to this temple. The temple gets all decked up during the festivals that are staged here throughout the year. The temple hosts many festivals and celebrates them with utmost zeal and fervour. When in Yanam, you should definitely take some time out to visit the Kakinada port, one of the finest minor ports of the country. This is further characterized by the undomesticated location of the harbour and the shelter offered by the natural surroundings. The port contributes a lot as the communication head and is an asset to the town. Lately, the place has undergone a few changes and renovations. 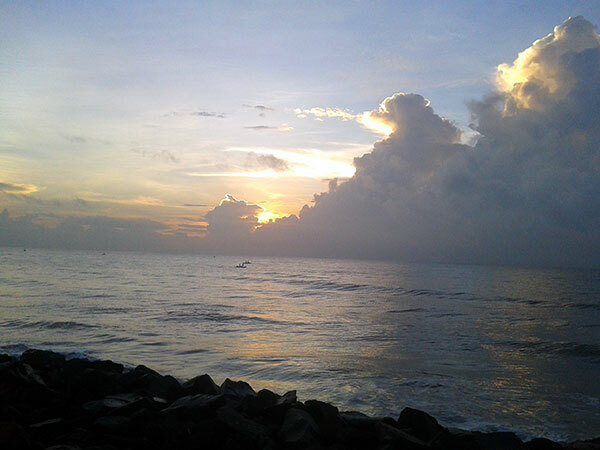 The Kakinada Port is a popular destination among travellers and tourists alike. The place is a major crowd puller, and hosts a lot of water sports activities as well.